These Pumpkin Sugar Cookies are soft batch baked! 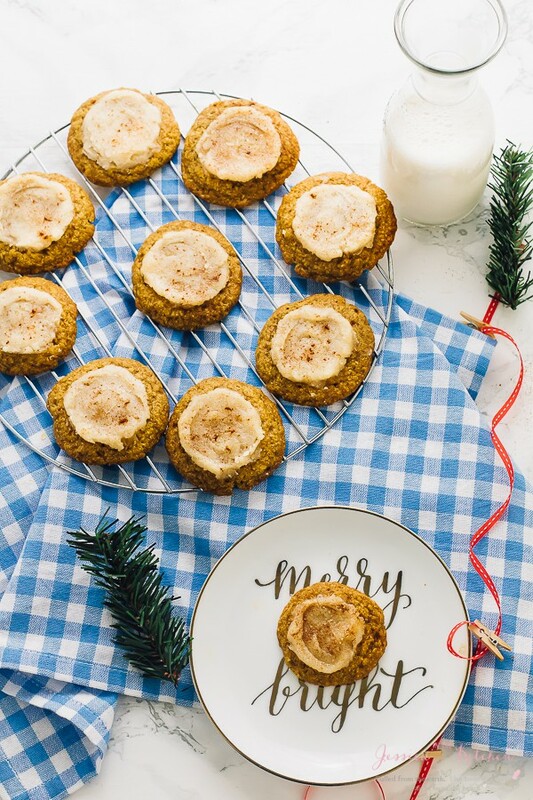 They are an easy healthier festive cookie, vegan and gluten free, and are topped with an irresistible coconut butter frosting! Cookies. Is there a soul on earth who doesn’t love cookies?! We all love to eat them, but so many of us don’t love actually making them from scratch. So many precise instructions, so many ingredients and so intimidating, right? Not this time. This cookie dough is so fool proof and easy that it is as simple as mix, chill, scoop and bake. 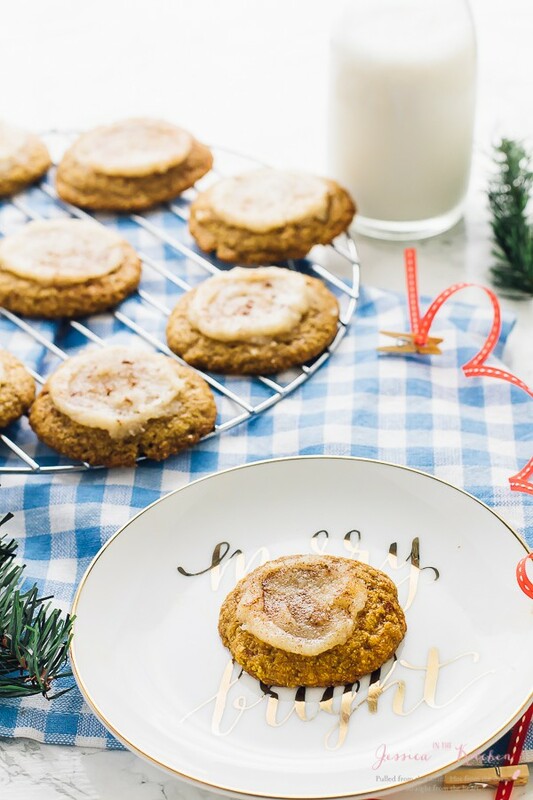 I guarantee you’ll not only enjoy making these Pumpkin Sugar Cookies, but that you’ll also add them to your regular list. P.S. This is the perfect time to use up all that pumpkin purée possibly sitting in your freezer. I’ve never met a cookie that I didn’t like. White chocolate macadamia, chocolate chip, raisin, cranberry pistachio, I love them all. This is exactly where I launch into my shrimp is the chicken of sea cookie comparison. YES, I just watched Forrest Gump FOR THE first time two months ago and I think I’ve successfully used that quote by Bubba in any scenario possible. 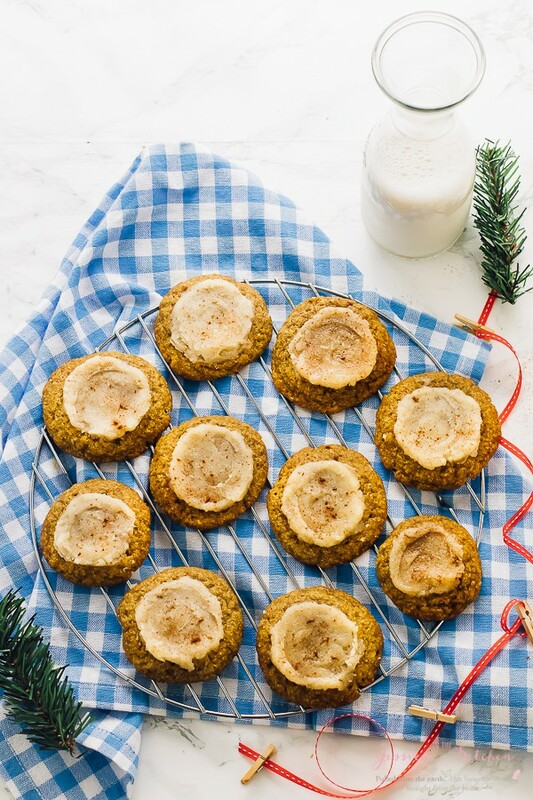 These pumpkin sugar cookies are no exception. 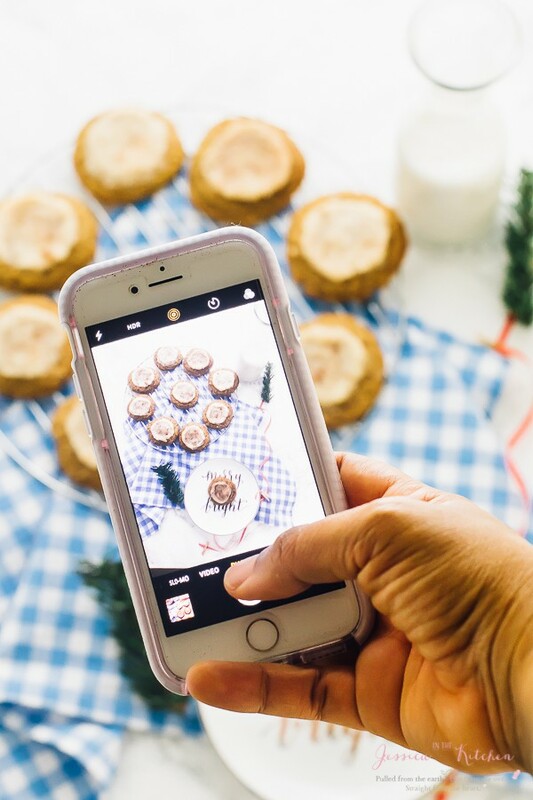 I fell head over heels with just one bite, which proved to be a problem since I had to finish shooting the video for these cookies. I begrudgingly waited so I could shoot them properly, all the while the freshly baked cookie smell was wafting in every corner of the house. As soon as I could, I took a second bite of these cookies. So soft, so light and so festive. Making soft batch cookies is one of my favourite ways to make cookies. They become bakery soft, have a slight chewiness to them, and taste absolutely wonderful. The fact that these cookies are made with Gluten free oats meant they had just the perfect amount of slight chewiness to them. The spices go a long way in these cookies. You get the right amount of hints of all spice, cinnamon, nutmeg and cloves and none are overpowering. I definitely wouldn’t leave them out since they make such a great impact on taste. Let’s talk about the pumpkin, shall we? So many people fear they’ll taste the pumpkin in an overpowering way. You don’t. The pumpkin acts as a binder and a fat substitute in these cookies, contributing again to how amazing these are. Interestingly, this recipe is the exact same as my vegan choc chip cookie recipe, but they taste completely different. In that recipe the chocolate really shines through, while here you get a deliciously pumpkin spiced cookie topped with coconut butter frosting. Speaking of coconut butter frosting, this is totally optional, but a definite win. I shared a recipe for coconut butter earlier this week, and it definitely speaks to my heart. Around the time I made the ocncout butter, I watched a video on Youtube from The Kitchy Kitchen that featured Sweet Laurel Bakery’s Coconut Butter frosting/icing. 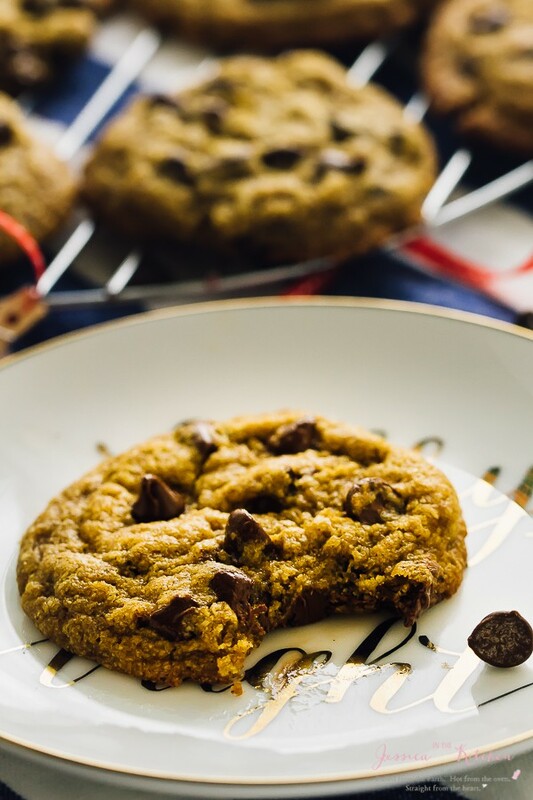 I edited it quite a bit but kept the essentials as it truly is an amazing, healthy topping for these cookies. Top with more pumpkin spice, and you are good to go! 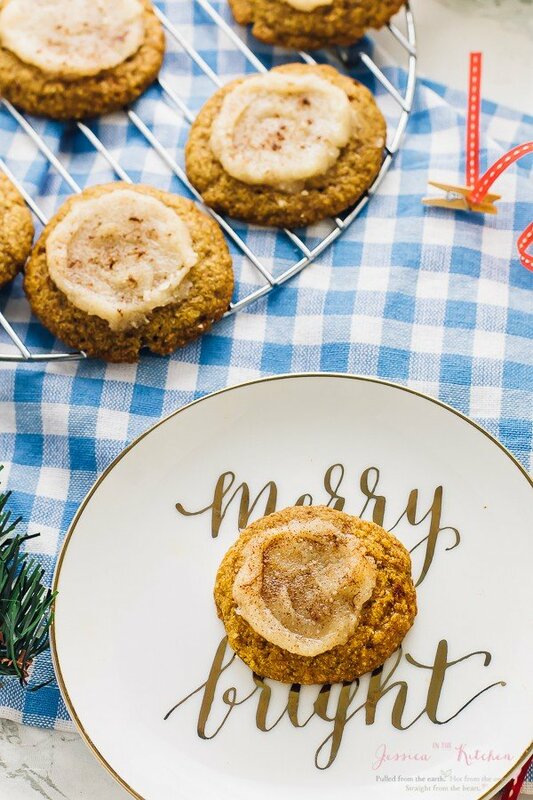 If you try any these Pumpkin Sugar Cookies please let me know in the comment section below, or tag me on instagram with the hashtag #jessicainthekitchen! For more exclusive recipes follow me on Instagram AND on Snapchat: jessinkitchen. 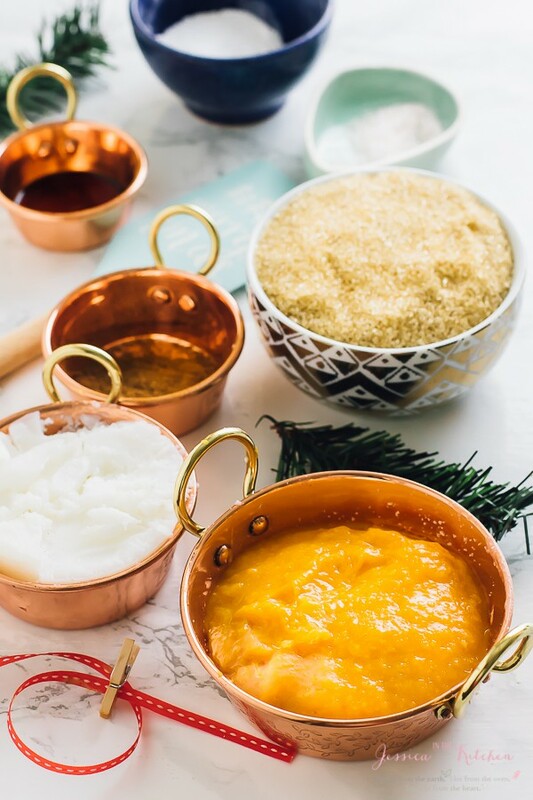 In a small bowl, add the oat flour, xantham gum, baking powder and baking soda, pumpkin spice, cinnamon and sea salt. Mix together thoroughly. Set aside. In a large bowl, add the coconut oil and the sugar. With a standing mixer or a hand mix, until thoroughly incorporated, about 5 minutes. Add the vanilla extract and the pumpkin purée. Blend until thoroughly incorporated, scraping down sides, for about 3 minutes. Add the dry ingredients to the wet in two batches, and mix with mixer until incorporated. Scrape down the sides to gather all the dough and gently fold in. Form dough into a large ball or two smaller balls and cover with Saran wrap. Place in the fridge for at least 2 hours to set up. Preheat oven to 350 degrees. Remove Saran Wrap and scoop 1-2 tablespoons out of the dough. Roll slightly between fingers to form a ball. Place out dough ball on a lined cookie sheet, leaving adequate space between each. Ensure the dough balls are higher rather than wider to ensure they stay as thick as possible. Use more than one cookie sheet if necessary. Place back in fridge for 10 minutes to ensure dough is very cold. Bake for 10-13 minutes for smaller cookies and 12-15 minutes for larger cookies; 15 will still be soft but slightly firmer. Remove and let cool for exactly 10 minutes. Lightly spread coconut butter frosting on top and sprinkle with pumpkin spice. Serve and enjoy!! While the cookies are baking, mix together all the ingredients in a small pan over medium low heat to combine. Whisk vigorously and allow to cool completely. Spread over cookies. If you want a harder icing, you can place it in the fridge first. That coconut butter frosting is a MUST! They are deliciously healthy and festive, Jessica. Thanks so much Angie! Definitely!! I would freeze without the frosting, then frost once thawed! You can also freeze the dough itself. I hope that helps! I just stumbled across your blog looking for recipes for my son who has multiple allergies. Could I sub vegan butter for the coconut oil, as he’s allergic to coconut? Thanks! !